People have been asking about our new mission house they are working rain or shine. Some are saying it's looking like Noah's Ark . Thanks for praying for the activity in Park. A lot of folks heard the Word. We all had fun some a little too much. This is going to be a big weekend in Playa Del Carmen. We are launching what we hope will be a new worship that would attract 100's of working class folks. We are starting in the city park this Sat. at 6:00pm. We are going to have a Mariachi praise band and a fiesta in the park, we have plans to meet in the park for the next 3 weeks. Also pray for our services in Paamul: Doug will be preaching and both services this week in Paamul English and Spanish. Darla' mom's Biopsy came back negative!!!! She does not have cancer this is an answer to many prayers. Thanks for praying. We had a great weekend, Please continue to pray for a new worship service starting this Sat. 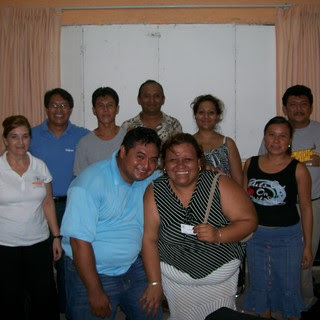 It's raining gatos y perros in Paamul today but 29 people came out to pray for our new church launch in Playa. I am preaching on busyness this weekend. You would thing that would not be problem in Mexico but it is. Many Americans move down here to get out of the rat race in the States and in just a few months they are back to the busy lifestyle. There is a rat race here as well the only difference is the rats here speak Spanish. 1. There’s not enough time to do everything I need to do. I could say I have had a really busy week that is why I have had time to post on my blog. We are still praying for Darla's Mom as she waits for test results. Darla is having a few medical test done as well so please pray for her. Pray for wisdom for us as we are building a small house in Paamul. Doug will be preaching this week in English at the Paamul Campus. Jose is preaching at the Colosio Campus. 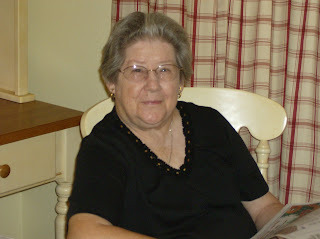 Thanks for your prayers: We don't have any word yet on the health of Darla's Mom. Please keep her in your prayers. Our house is going up.... We are getting exicited about our new house. It will be small but it should meet our needs. We had plan to build the house with help from volunteer teams from the states but both team that had plan to help us have had to change their plans. Now we are in the middle of this house project and we are praying we will have money to finish the project. WE are still praying for Darla' Mom. We hope to have word on the biopsy. Thanks for your Prayers and we need your support and friendship. We had church services in a flood today. We had a good number of people at all our worship services even though we were having very heavy rain. Tomorrow Cris is going to preach at our Paamul Campus in English. Jose is going to be preach at the Colosio Campus. We all need your prayers. The block started going up today. Pray for these workers I am talking with them everyday about the Lord. Please ask your church and friends to pray for us as we work to launch a new worship service in Playa Del Carmen. The first service will be Sept. 29th.... We are planing to meet in the the city park. I have hired a mariachi band and we are going to start promotion next week so please PRAY! We offer a free medical and dental clinic each Wednesday afternoon out at our Colosio Campus in Playa del Carmen. 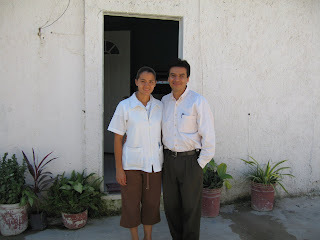 Pray for Dr. Daniel and Ana as they give their time and service each week. Love is not just something you say it is something you do. 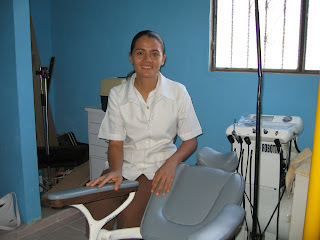 The goal of our medical and dental ministry is not only to give great medical care to the poor. But it is also that the people living in Playa will know that God loves them and so does the Community Fellowship Church. Pray that this ministry will continue to be life changing. Hurricane Felix makes landfall fall south of us. We are now praying for our friends to the South. 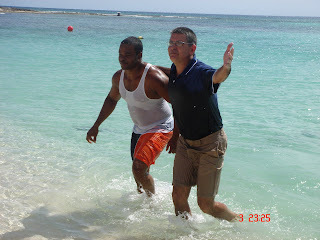 Many of you may know Marc Heffern he is now living on the Roatan an island off the coast of Honduras. I received this email from Marc this morning. Were good here - It seems h-felix has missed us. We might get some wind/rain but it is still nice. We will not know what kind of help (if any) the main landers will need for another day or two. 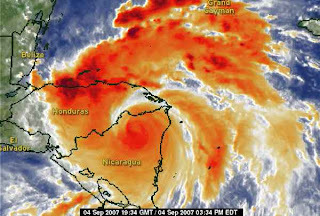 The Roatan tourists was evacuated yesterday and we were preparing for a direct hit - so we are feeling very grateful. Please pray for these working who are helping us build our new home. We have hired a team of about 10 local workers to dig the foundation and lay block. These guys are all non-believers this morning before we started work I asked if I could pray for them, of course they said great but I know it was like whatever the boss wants to do. This afternoon the lead guy, Freddie, said he really like my prayer and he wanted to know more about our church. Please pray for Freddie and his team. Twenty two people came to church last Sunday in our church’s 15 passenger van. Thanks to the generous donation of Good Hope Baptist Church in Morrisville, NC. these families are now able to come and hear the Good News. Some friends of our at Good Hope said they had a church van that was not being used and they wanted to donate it to missions. Now we see that bus ministry will work at our Paamul campus we need your help. We could fill our Paamul building if we had 10 vans. Please help us! If your church has a van that is 10 years old or older we can import it into Mexico. Bus ministry will still work in Mexico. Trazie is leading our music in the English Church in Paamul. He is from Jamaica but has lived here in Mexico for years. growing in the Lord each week. Ruben is our Worship leader in Spanish at the Paamul Campus. 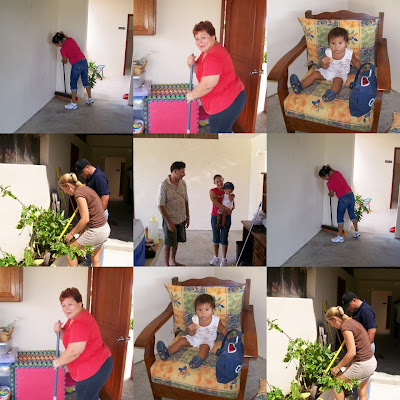 We had a group of church members cleaning and working hard at the church building in Paamul this morning. We are still cleaning up from hurricane Dean now we are hearing that we have a new storm that might be headed our way. Please keep us in your prayers.